'They were hanged at dead of night on October 16 - hanged, that is with the exception of Goring. He, mocking to the end, took cyanide of potassium in his cell as the hour approached and was dead by the time the doctors were called. The finding of the board of inquiry that he had it all the time fit in well enough with the little ironical smile that we saw in the dock. For a day he made sport of Nuremberg, above all of American security and its year of pin-pricks. But Goring is dead and the others with him. It could hardly have been more sordid - the grimy prison gymnasium in which soldiers played their ball games, with its row of blazing lights, its three scaffolds, the ugly scrawled inscription on one of the wall 'V. D. walks the streets.' Hollywood to the end. And one after another the monstrous leaders of the Third Reich fell with the name of the Fatherland on their lips. Have we after all created a grotesque legend?' This is how Robert Cooper's book ends. 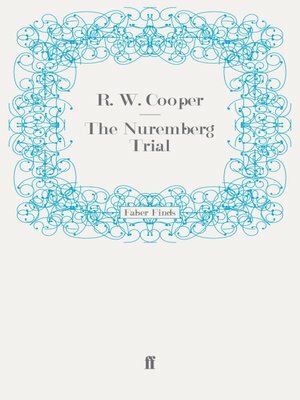 The book itself has the distinction of being the very first to have been published about the Nuremberg Trial. Its business was finished in October 1946: this book was published in January 1947. Penguin was its publisher, and it is worth quoting from the original blurb, 'This popular but full account of the epoch-making trial of the War criminals at Nuremberg, specially written for Penguin Books by The Times special correspondent who covered the process, is intended as a permanent summary and record of the first attempt to bring to justice the authors and begetters of international crime against humanity.' The author admits to there being 'many gaps and other deficiencies in this necessarily hurried summary of the Nuremberg Trial' and pleads with History to bring about a perspective, but it is the very immediacy of the account that makes it so compelling and still worth reading.